For many homeowners, installing hardwood floors is a desirable remodeling project because of hardwood flooring’s traditional beauty and sophistication. 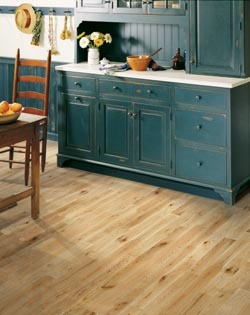 Hardwood is known for its visual charm. As a retailer of high-quality hardwood flooring, our store features an impressive collection of exquisite discount options from superior manufacturers. You can feel assured that our company's hardwood floors are built with resilient and quality materials! Whether you want a hardwood floor for the hallway or you need installation services for several rooms, we can help you from beginning to end! Turn to our hardwood flooring experts today for service. Due to advancements in the flooring industry, there are never-ending types of floor coverings available. Engineered hardwood flooring is among the most popular. Designed with multiple layers, usually between three to 12, engineered hardwood is available in nearly any wood species. Beautiful and durable, engineered hardwood flooring is known for its moisture resistance. In fact, it can be installed in any area that is prone to having moisture issues, such as basements. Additionally, it can be glued directly over concrete slabs, or stapled directly over a subfloor. Contrary to popular belief, not all engineered hardwood flooring is exactly the same. Many homeowners think that it isn't as strong or appealing as solid wood flooring. Nothing could be further from the truth. While engineered wood floors are more affordable than solid wood, they're made with some of the highest quality materials on the market. Discover if engineered hardwood flooring is the right option for your home and visit one of our hardwood flooring specialists today. Are you looking for new flooring? Solid hardwood may be the ideal choice. It's no secret that solid hardwood flooring has been a sought-after covering for centuries. What makes this floor covering so special? First and foremost, it has a beautiful appearance. When cleaned and maintained properly, your hardwood is sure to make a lasting impression. While it's most well-known for its unparalleled beauty, there is much more to solid hardwood than looks alone. Put simply, it is one of the toughest and most durable types of flooring available. In fact, it is proven to withstand heavy foot traffic and active workspaces. Are you worried about dust and allergens? Solid hardwood is an ideal choice for your home. Free of grout lines, fibers, and embossing that traps allergens, hardwood will help you maintain a healthy indoor environment year round. When it comes to hardwood flooring, determining if you want solid or engineered floors isn't your only choice. You also have to pick between a smooth or hand-scraped surface. In years' past, homeowners associated a smooth surface with flawlessness. Today, homeowners are turning more toward hand-scraped hardwood. This type of flooring will maintain a beautiful appearance for a lifetime, while hiding imperfections like scratches, which can occur with regular wear and tear. Many retailers only sell floor coverings. Here, we're proud to say that we install everything we sell! Make sure to request a hardwood flooring installation to ensure your new floors are installed correctly the first time. Customer satisfaction is of the utmost importance. That's why, as a reputable hardwood flooring dealer, we offer our Ultimate Confidence Guarantee. If you're not satisfied with your new wood floors for any reason, let us know within 30 days of the initial hardwood flooring installation. We will replace it at no additional charge, and we'll even cover the labor costs. Contact us to learn more about our hardwood flooring sales and installation. We proudly serve the communities of Oklahoma City, Midwest City, Moore, Yukon, Edmond, Norman and Bethany, Oklahoma.